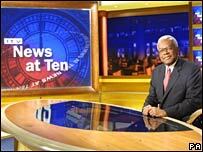 News at Ten will return to ITV1, presented by Sir Trevor McDonald, nine years after it was first moved, it has been reported. He will present the bulletin with Sky newsreader Julie Etchingham, according to reports unconfirmed by ITV. News at Ten was replaced with a 2300 bulletin in 1999 to let ITV show movies and sport uninterrupted, but the channel lost viewers as a result. News at Ten was revived in 2001 but then replaced by a 2230 bulletin. News at Ten was ITV's flagship news programme before its replacement in 1999. Ratings for ITV news subsequently dropped by one million, 14% of the available audience. Its replacement bulletin was occasionally moved from its 2300 timeslot as sports events over-ran, leading to it being referred to as "News at When?" ITV executive chairman Michael Grade recently called the replacement of News At Ten "a shocking mistake" that "damaged ITV more than anything". Sir Trevor, 68, left ITN in 2005 after the revived News at Ten was moved once again. But he continued to present current affairs programme Tonight With Trevor McDonald. He also recently hosted satirical show News Knight. Reports of News at Ten's return follow BBC newsreader Natasha Kaplinsky's departure to Five. Last week the BBC announced that her co-presenter George Alagiah would present BBC One's early evening news bulletin alone following her departure in the New Year. Should News at Ten return to ITV? No - what difference does it make?